If you decide to spend time marketing on Pinterest, your overall aim is to capture the attention of potential clients on the platform to grow your business. So, how do you design a Pinterest marketing strategy that converts clicks into signups or sales? Find out in this Pinterest Marketing Strategy Guide. Your preferred customer should be at the heart of everything you do. In today’s world, customers are marketers. Start by providing lots of value on your website with free content. 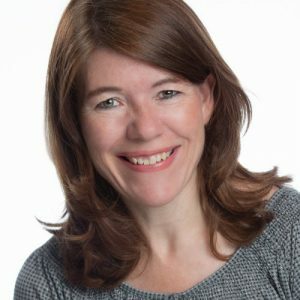 For example, a business coach could regularly publish content based on questions that clients ask during coaching sessions or in a Facebook group. The resulting blog articles and/or videos need to be extremely helpful and practical. They should provide ideas and information that people are searching for on Pinterest and Google. This also works very well if you sell products. Instead of posting only product images, you could write a short article related to a product. If you sell scarves, you could write about “10 ways to wear a scarf” then reference or link to your own online store in the article. When launching a marketing campaign on Pinterest, whether organic or paid, start with your end goal and then design your strategy backwards. 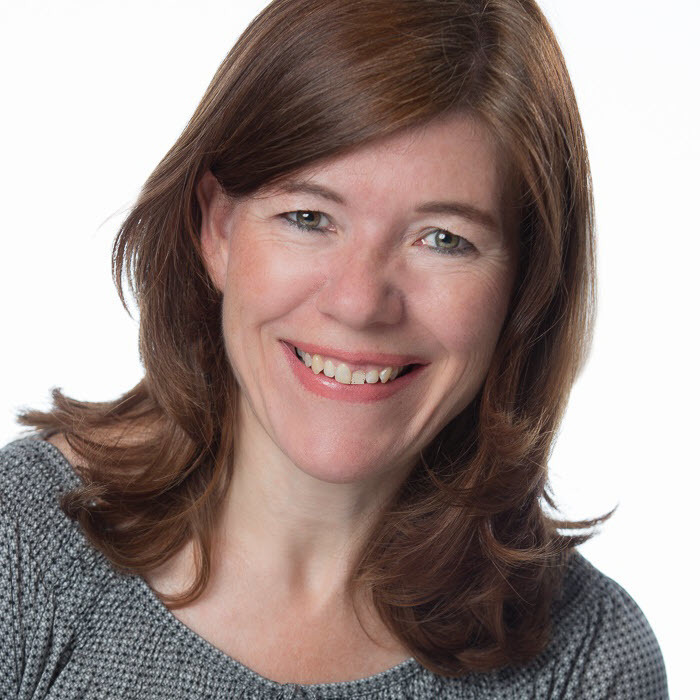 Let’s imagine that the business coach, mentioned earlier, recently launched a new course on “How to find your first clients”. A couple of months before launching this new course, she started preparing for it by creating a “Get First Clients Checklist” for newbie entrepreneurs. This checklist serves as a lead magnet to attract the right people to sign up for her mailing list. She included a sign-up box for this checklist in relevant blog posts and regularly published these articles on Pinterest. Besides organic pinning, she also promoted some of the pins to a more closely targeted audience through a paid Pinterest ad campaign. For each article, she created one or more high-quality vertical images (2:3 ratio) for Pinterest. Each contains a clear message that makes interested pinners want to click to find out more. When people click through and read the article, they may be interested to sign up for the checklist. Once signed up, she nurtures the people on the list by providing lots of additional value. Subscribers need to know, like and trust her before they will buy anything. To increase conversions, it is essential to first work out all the details of this backward chain of events. 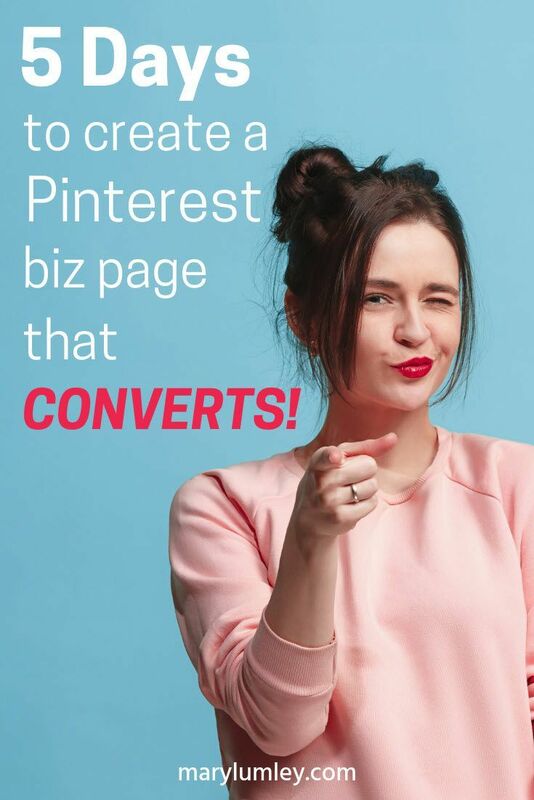 After you've set up your business account, learn how to build a Pinterest page that brings you business! There are different ways people can stumble upon your content on Pinterest. Most searches on Pinterest are still done through keyword search. Even on a visual search engine like Pinterest! To optimize the chance of your content getting found, the titles and descriptions of your boards and pins should include actual search terms that people use to search on Pinterest. Do some research on Pinterest (and Google!) to see what keywords and key phrases they use to find the product/services you sell. Document them in a list and refer to this list every time you publish new content. Update this document regularly. The Pinterest search bar is great tool to find keywords. 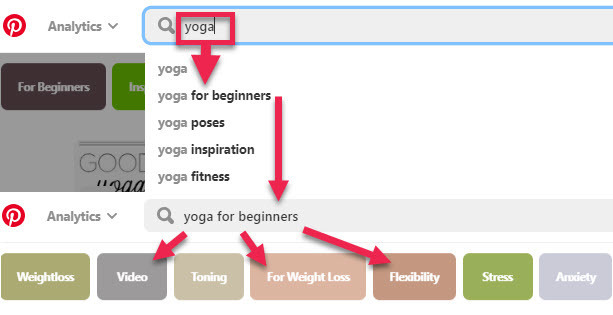 To better understand how it works, type a few keywords in the Pinterest search bar. Take note of the suggested keywords (see example below). Do a similar search for categories and keep drilling down the list of categories you are presented with. This will give you a good idea of the most frequently used keywords. If you already have a Pinterest business account, make note of the traffic that Pinterest is currently sending you. You should track progress on a regular basis - it tells you if your marketing efforts are paying off, or not. This also applies to newbies on Pinterest - even though you do not have any historical data to benchmark against, monthly tracking will be helpful to monitor future progress. At the end of each month, head over to Pinterest Analytics and Google Analytics to export the data you need to track and measure your success. Click here to find out what basic metrics you should focus on. If you are running a paid Pinterest campaign, check your campaign statistics from time to time to see if any adjustments are needed. I recommend starting by mastering organic pinning to help you understand the platform and what works best for you. Once you’re comfortable with that, try out Promoted Pins. They help you get to the top of search results much faster than organic pins. A paid campaign gives you access to additional keyword information that is not available for organic pins. It also gives you detailed information about your conversions. Give your paid pin time to get ranked by the Pinterest algorithm - it takes click-through rate into account, so it’s best to leave it to run for a little while, at least 7 days, to let it gain momentum. The longer the campaign, the easier it is for Pinterest to optimize performance. Campaign results for the same pin or ad group (group of promoted pins) can vary enormously, depending on duration. For more Pinterest Marketing advice visit the blog on marylumley.com. This blog post is an extract from an article written for SocialBakers: How to Build a Successful Pinterest Marketing Strategy: A Marketer's Guide.